The Centre has undertaken a number of projects for external bodies including an analysis of pressures facing chartered accountants in business for the London Society of Chartered Accountants and a series of Research Reports for a leading Spanish bank. 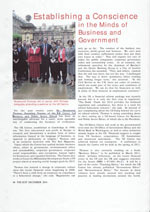 Centre for Business and Public Sector Ethics has held numerous international Conferences since 1988 in Cambridge, and in other locations, attended by academics, government leaders, and top businessmen. 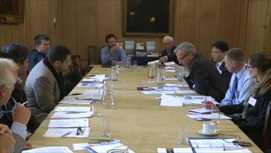 The Centre has hosted 16 major Seminars in Cambridge since 1995 for delegations from the People's Republic of China and also sent a representative to Seminars organised by the University of Guelph, Canada; the British Embassy, Madrid; the Institute of Directors, City of London branch; The British Council; Wilton Park; and the British Assn. for Central and Eastern Europe. 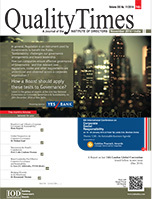 We can assist business companies and Governments globally with consultancy/advisory services. The Centre has already given specialist advice to the Cadbury Committee on Corporate Governance; The UK Law Commission; The House of Lords; the UK Committee on Standards in Public Life (then the Nolan Committee); and the US President's Ethics Law Reform Commission among others. Leading Universities, distinguished business executives and government officials have visited the Centre in Cambridge, including from the Body Shop; Bovince Ltd.; Caterpillar Inc. USA; HM Treasury; the UK Cabinet Office; the Hon Malcolm Wilkey of USA and Chile, South America; INSEAD; and the University of Tartu, Ulikool, Estonia. 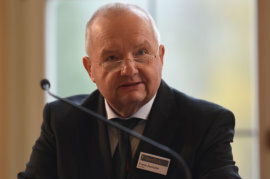 Professor Dr Frank Zschaler speaking at this Congress held at the Katholische University, Eichstätt, 16-17 November 2017. 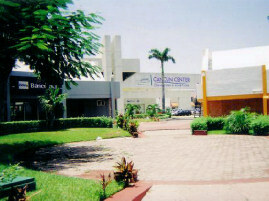 The Centre accepted to send a speaker to the Congress on Finance and Ethics. 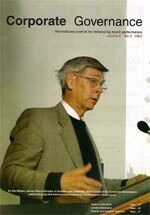 led by Professor Frank Zschaler of the Katholische University, Eichstätt-Ingolstadt, Germany. 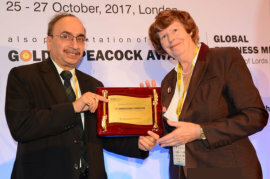 Dr Rosamund Thomas receiving a plaque following her speech at the Plenary Session, 25 October 2017. The Centre's Director spoke at the "London Global Convention on Corporate Governance and Sustainability" of the Indian Institute of Directors. Delegates from the State Council of the P.R. 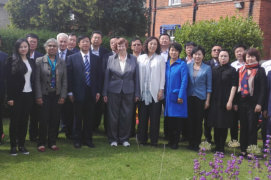 of China at the seminar held in Cambridge on 15 August 2016. A one-day seminar run by the Centre for delegates from the Research Office of the State Council, P.R. of China. 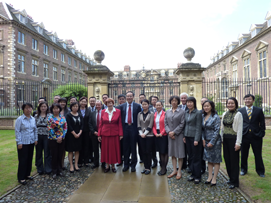 Delegates from Jilin province at the Cambridge seminar held on 1st July 2016. 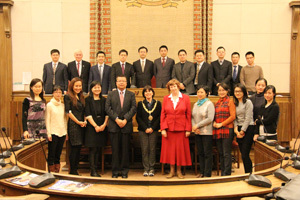 The Centre held a one-day seminar for delegates from the Jilin State-owned Assets Supervision and Administration Commission, P.R. of China. 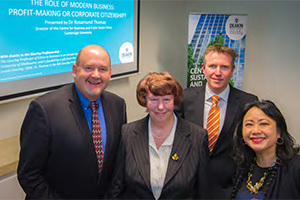 Pro Vice Chancellor, Faculty of Business and Law, Deakin University with his colleagues and Rosamund Thomas. Image courtesy of Deakin University. 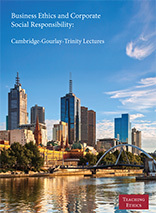 Rosamund Thomas, the Centre's Director, held the Gourlay Visiting Professorship in Business Ethics at Trinity College in The University of Melbourne, for 4 weeks 3 September - 3 October 2014. Under this Visiting Professorship, she spoke at other Melbourne institutions including Deakin University. 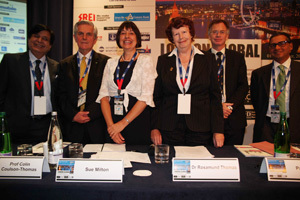 Dr Rosamund Thomas, the Centre`s Director, and other panel speakers, at the London Global Convention of the Institute of Directors, India. 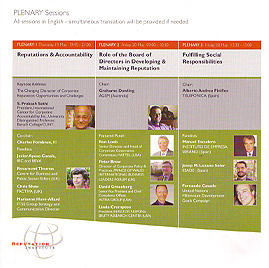 LONDON GLOBAL CONVENTION 2013 incorporating 13th International Conference on Corporate Governance & Sustainability. 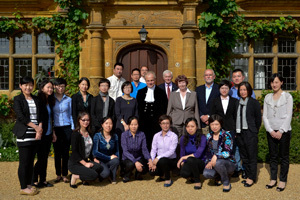 Senior Shanghai television and press executives, together with the High Sheriff of Cambridgeshire, following his address to the delegates on 21 August 2013. During 2013 our Centre held 8 intensive seminars at different dates for visiting senior delegates from numerous Ministries of the Central Government of the P.R. of China, as well as from Chinese local governments. These seminars included 5 days from 19-23 August 2013 for Shanghai television and press executives under the auspices of Shanghai Municipal Government. 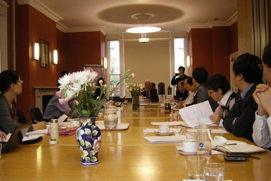 The Centre ran 4 separate seminars in 2013 for the UK Economic and Social Research Council (ESRC) on BRIC countries (Brazil, Russia, India and China). These one-day seminars brought together UK academic researchers to meet business and government representatives from each of these 4 countries in turn. 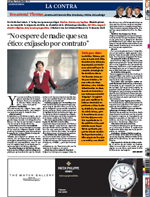 Video extract of final rounding up by Dr Rosamund Thomas of the UK-Brazil ESRC/Centre Seminar 24 June 2013. Click to download mp4 video clip. A series of 5-day Seminars was held by our Centre for a Shanghai Media delegation of top television and newspaper executives. 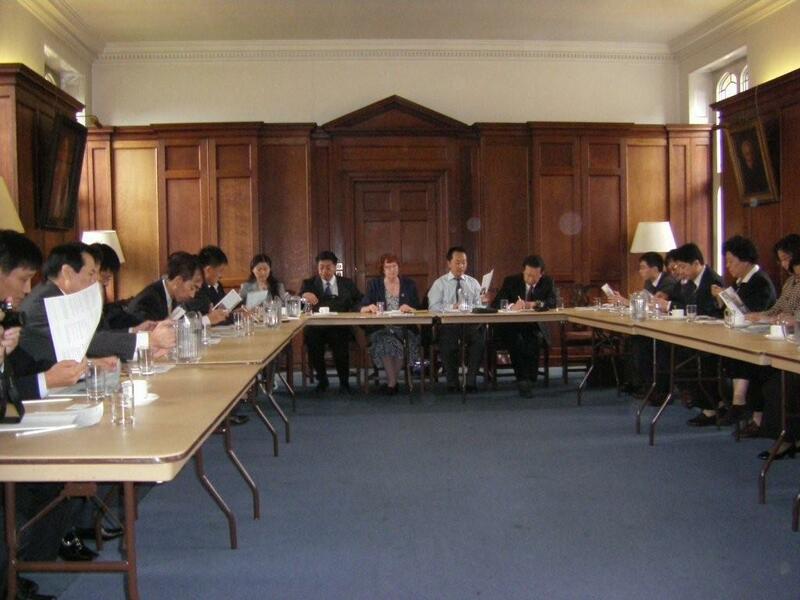 Many other Seminars took place for visiting senior Chinese delegations to our Centre during 2013. 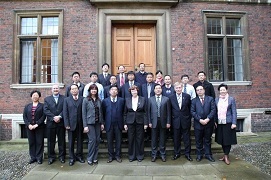 Numerous other Seminars were run by our Centre for visiting Chinese Government Officials from January to December 2011. The Centre's Director was a Speaker at the 2nd CSR Lebanon Forum on 'Banking & Finance 2012: The Social Risk'. The Centre's Director was a Guest Speaker at Ramon Llull University, Barcelona, and the Jordi Pujol Centre, Barcelona, 28 - 30 September 2011. Dr R. Thomas, speaking, and Ms Susan Bird (far left) of the European Commission, Brussels, September 2011. Dr R. Thomas, the Centre's Director spoke at an event organised at the European Institute for Asian Studies, Brussels, 6 September 2011. Roundtable on 'New Routes for Global Finance', Brussels, May 2011. 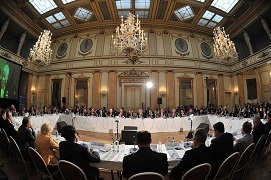 The Centre's Director was invited to attend a high-level banking Roundtable in Brussels on 19 May 2011. 5 days of Seminars for Shanghai Creative Industries' delegates. 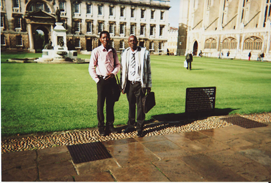 Two executives from COPE - AFRICA based in Nigeria, visted the Centre for talks on anti-corruption in October 2010 . Three Chinese delegations from the Government of the P.R. 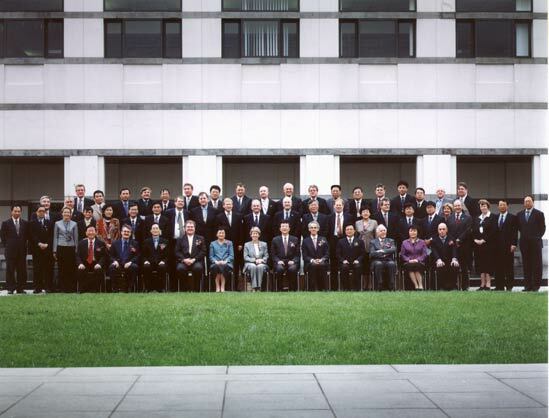 of China attended high-level Seminars held by the Centre in October 2009. A senior delegation from the Government of the P.R. of China attended a Centre Seminar on "Ethics and Anti-Corruption". Dr Rosamund Thomas, the Centre's Director, delivered a paper on 'Equality and Diversity' at a Round Table held at Carmona, Seville, Spain, 13-14 November 2008. Dr Rosamund Thomas, the Centre's Director, was a Speaker at the 6th Annual PhD Conference of the European Academy of Business in Society held at Ashridge Business School, 13 September 2008. 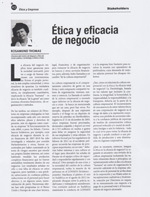 The Centre's Director was a participant in a symposium on 'Managing Diversity in Business Schools' organised by ESADE Business School, Madrid Campus, Spain on 23 June 2008. 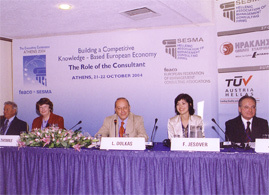 The Centre's Director was a speaker at a conference entitled, 'Doing Business Socially '07' held in May 2007 by a leading group of Greek companies. Dr Rosamund Thomas was a Keynote Speaker at the Fourth Latin American Convention on 'Corporate Social Responsibility' for the oil and gas industries of the region, 19 - 20 July 2006. 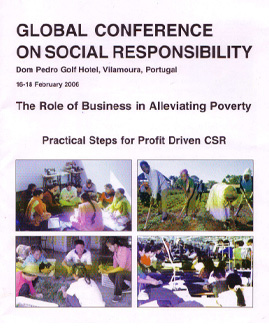 The Centre's Director, Dr Rosamund Thomas, spoke at 'The Global Conference on Social Responsibility' which took place in Vilamoura, Portugal, 16-18 February 2006. 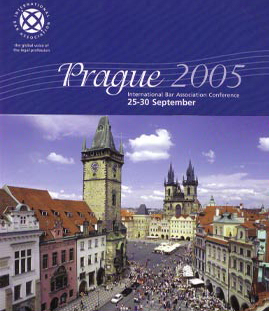 Dr Rosamund Thomas was a speaker at the International Bar Association Annual Conference, Prague, The Czech Republic, 25-30 September 2005. 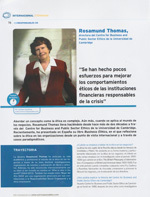 A representative from the Centre (Dr Rosamund Thomas) spoke at the Reputation Institute's 9th Conference held in Madrid, Spain, 19th May 2005. A sixth delegation from the Government of the People's Republic of China attended a Seminar given by the Centre on 'Excellence and Ethics in the Public Service'. Dr Rosamund Thomas spoke in the Showcase Session on 'Human Rights and Corporate Social Responsibility' at the International Bar Association (IBA) Annual Conference. An evening function at the IBA Conference. The Centre's Director was invited to participate in the European Federation, and Hellenic Association, of Management Consultants Conference. 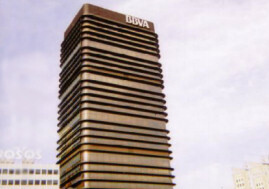 Dr Rosamund Thomas, the Centre's Director, addressed some 60 senior bank Managers and Directors at BBVA on the subject of 'Business Ethics and Corporate Reputation'. A fifth delegation from the Government of the People's Republic of China visited the Centre for a Seminar on 'Teaching Citizenship'. 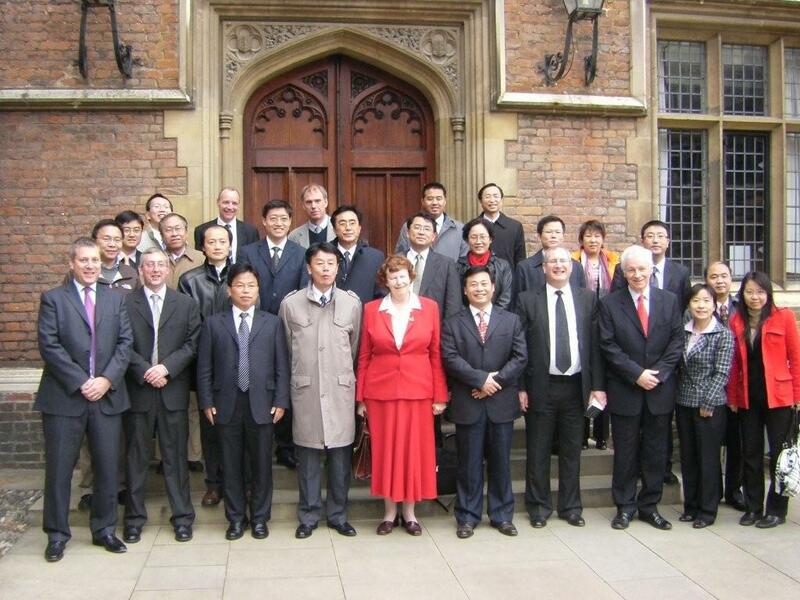 An innovative UK - China Forum for Chief Executive Officers (CEOs) led by the British Consulate General Shanghai and attended by Dr Rosamund Thomas, the Centre's Director Congratulations to Paul Sizeland, then British Consul General Shaghai, for this excellent initiative! 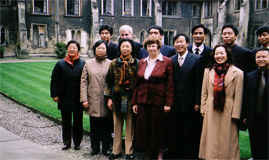 Dr Rosamund Thomas, the Centre's Director, and others with the Chinese delegation in Cambridge, June 2002. 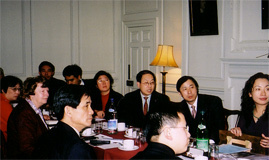 A third delegation to the Centre in Cambridge from the Government of the People's Republic of China for a follow up Seminar on 'Ethics in Government and Anti-Corruption', 17 June 2002. 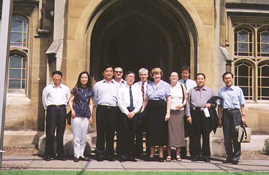 Representatives of Centre for Business and Public Sector Ethics with the Chinese delegation in Cambridge, June 2002. 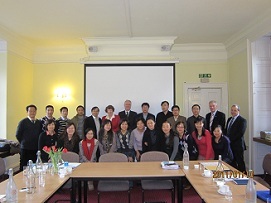 Chinese and Centre Seminar participants on guided tour of Cambridge colleges. 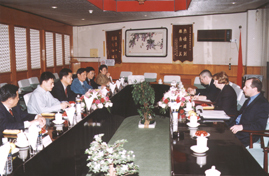 A delegation from Centre for Business and Public Sector Ethics visited representatives of the Government of the People's Republic of China (PRC) from 17 -24 March 2002, for a series of Seminars on 'Ethics in Government' in Beijing and Shanghai. 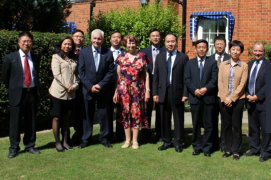 Beijing Seminar led by Centre for Business and Public Sector Ethics at a Training Academy for Chinese public officials. 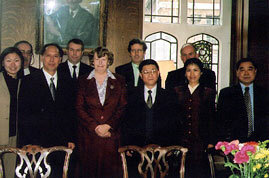 Shanghai reception for Centre for Business and Public Sector Ethics' delegation, March 2002. Shanghai: Key Seminar with Centre for Business and Public Sector Ethics and leading local Chinese Government Officials studying together 'Ethics in Government'. 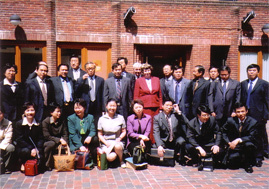 Centre's delegation with Government officials of P.R. China Shanghai Museum, March 2002. 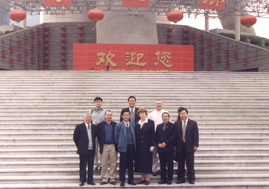 Shanghai: Cultural visit by the Centre's delegation to the new Shanghai museum which was the venue for the APEC Conference in 2001. 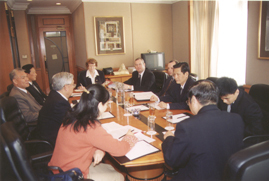 The Centre's Director participated in a Conference on Corporate Social Responsibility, 27-28 November 2001, hosted under the Belgian Presidency of the European Union with the European Commission. The Centre's Director addressed senior executives and students in Madrid, Spain on 'Corporate Social Responsibility and Business Ethics in Europe' in association with BBVA, ZEIA, the Spanish Railways, Renfe, and the University Complutense, Madrid. 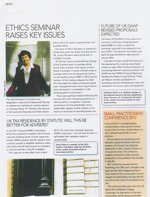 The Centre collaborated with leading conference organisers in London to run a conference on 'Accountability and Ethics in the Public Sector'. 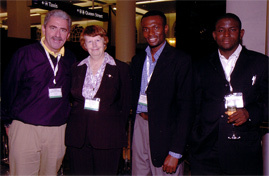 Dr Rosamund Thomas was a speaker at the international Conference on 'Ethics in the Public Sector' attended by the then Prime Minister of Canada the Hon. Jean Chrétien. Her paper was published later in the US Journal 'Public Integrity' of the American Society for Public Administration, Summer 2001. 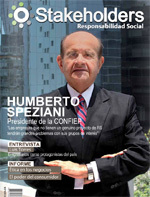 The Centre's Director was elected Co-Chair of the IPSA Research Group RC48. In that capacity Rosamund Thomas chaired sessions and acted as Commentator alongside Professor R D Sharma and Professor F W Riggs. In association with the British High Commission, New Delhi, the Foreign and Commonwealth Office London, and the British Council, India, the Centre's Director Dr Thomas undertook an extensive Lecture tour of Universities, public sector bodies and chambers of commerce in India and Pakistan. Dr Thomas also gave an address to the International Bar Association international Conference, New Delhi, 1997, on 'Lessons to be learnt from the Bhopal Disaster and other Industrial Accidents'. 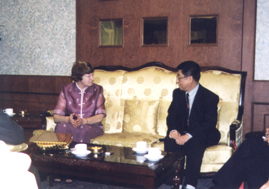 Dr Rosamund Thomas gave a keynote address to an international Conference hosted by the State Government of Queensland in 1996. 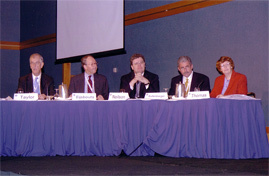 The Centre's Director addressed a 90 nation international Conference on 'Ethics in Government' hosted by the US Federal Government in 1994. A Comparison of British and American Ideas 1900 - 1939. 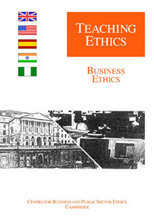 Government Ethics provides the world for the first time with a unique and international body of knowledge on ethics in Government and the public sector. 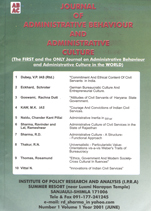 This book contains the views of distinguished experts in Government and academia and includes codes of conduct for Government officials, issues of official secrecy, privacy and military and police ethics. It also discusses conceptual values like 'trust'. Environmental Ethics relates to 'corporate and social responsibility' by Government, industry, the professions and scientists for the community and the environment. The book focuses on standards, quality, environmental audit and 'best practice', as well as ideals towards which countries can aspire to protect the global environment and implement the Rio Treaties. Environmental Ethics integrates, but extends, the subjects of environmental law and sustainable management. This 'classic' book records the intellectual and practical developments in British public and business administration for the period 1900 - 1939, compared to American developments. 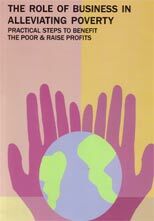 The book has a foundation chapter on 'ethics' showing how UK Quaker companies, like Rowntree and Cadbury, set examples in 'corporate responsibility' in that era, many of which are relevant today. Other chapters cover policy-making, organisational theory and bureaucracy. For more information about this book, click here. For more information about this book, click here. For more information about this book, click here. 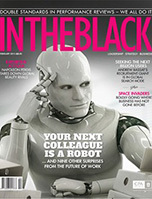 The latest research findings on Board developments and the role/work of the Company Secretary in a UK quoted company are found in this 60-page leading edge book. 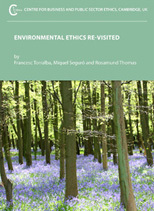 Available from the Centre, email info@ethicscentre.org for more information. 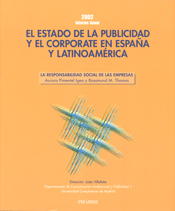 Spanish publication on Corporate Social Responsibility, 2002. 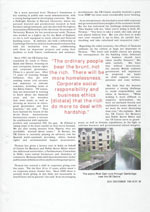 Public Integrity Journal published by ASPA, USA, Summer 2001. 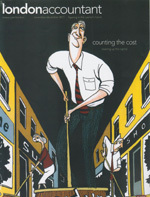 The Journal of Brand Management, January 1999. These Modules are designed for use globally by government leaders, civil servants, businessmen, bankers, academics, and other interested persons and institutions. Essential for legal reform; policy advice; policy implementation; education; training and learning, to meet the UN Global Compact 10th Principle and the UN Convention Against Corruption. 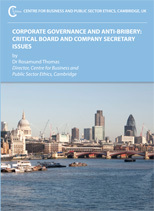 Also useful for FTSE4Good Anti-Corruption criteria. To order your DVD copy please click here.